I'm backing this book for autism research! Yo, check this out ... Volume 2 of the photography of some of the f-eleven members (who are a bunch of photographers and models) has just been published. The proceeds go to autism research so that's good. Here's a fancy slide show that shows off the book. But I got something else about this that I need to blog about! I don't usually promote books or stuff unless I'm in them so you know this is a good one! But another book said that all of us cats have Asperger's syndrome. Now that just sounds like name calling! BTW, the correct spelling is "Asperger," not "assburger." Hey, it's not some tasteless joke, I'm just mentioning it since I made that mistake so I assume that lots of my readers might too. This Asperger's thing is like autism - sort of, it's complicated. 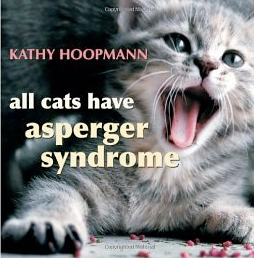 So anyways, back to the topic - the book about cats having Asperger's syndrome. This book says that all cats have it. I didn't know what it was so I wikied it and people with that have social and communication problems. I wouldn't say that I have a communication problem! Hell, I got a blog! Where do humans come up with this crap!! Cats just don't communicate much with humans (like skeezy dogs do) out of a natural sense of superiority that we have. Humans are supposed to just figure out what we want. I know cats are superior because humans have got us to make life better for people who have autism. You can't beat that! The story talks about how cat therapy was a miracle. That's right - have a cat - get a miracle! That's more than dogs could do! In fact, if it was a miracle that this cat did, then that makes cats like Jesus! Maybe I should start a church! !